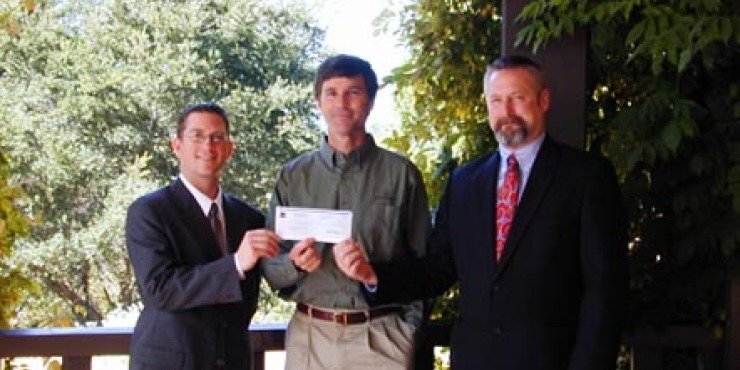 Watsonville based Graniterock interfaced with Wells Fargo when Graniterock CIO, Steve Snodgrass, accepted a donation on behalf of the Cabrillo Advancement Program on Friday, October 17th 2003. Steve sits on the Cabrillo College Foundation board, and assisted the Cabrillo College Foundation in securing a contribution from Wells Fargo Bank. The Cabrillo Advancement Program is an academic support and scholarship program dedicated to increasing the number of low-income students in local middle schools, junior high schools and high schools who graduate and enroll in college. CAP students receive after school tutoring, counseling, and opportunities for extra-curricular activities that promote their interest in preparing for college. CAP students are awarded a $1,000 scholarship, with interest, contingent on high school graduation and enrollment. Alternates are selected who do not receive a scholarship, but can participate in all other activities. Currently CAP offers services to 552 participants in nine schools. CAP is jointly funded by Cabrillo College and the Cabrillo College Foundation. The Foundation is seeking $500,000 for the CAP Endowment Fund. Stephen Snodgrass (middle) of Graniterock accepts a check on behalf of the Cabrillo Advancement Program from Steven Hoffman (left) and Steven Le Vá (right) of Wells Fargo. Graniterock was founded on Valentine’s Day, February 14, 1900. The company has operations in Watsonville, Santa Cruz, Seaside, Salinas, Hollister, Aromas, Felton, Oakland, San Jose, Redwood City and South San Francisco. Graniterock Pavex Construction Division is a significant heavy engineering contractor building roadways, airport and private commercial and residential projects. Graniterock has also been the recipient of the Malcolm Baldrige National Quality Award and the Governor’s Golden State Quality Award.